Our first artist this week is E. Young. 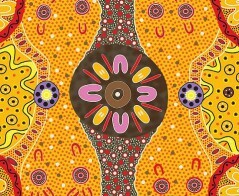 As a well known artist from the Northern Territory, she uses bright and vibrant colors for her artworks. 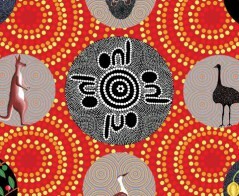 These works depict land, flora and fauna with a flavor of traditional Aboriginal culture. With this expertise, Young used her strong color sense in the Women’s Business artwork. In the natural environment women are sitting around the waterholes with coolamon (a basinlike dish made from wood or bark) and digging sticks. Wildflowers are visible with bright colors around the area. 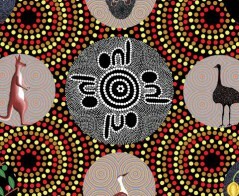 In Aboriginal culture, certain spiritual customs and practices are performed separately in a language group between men and women. These separate businesses are often referred to as men’s business and women’s business. 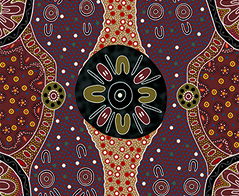 These businesses are carried out under strict guidance of unwritten Aboriginal laws. 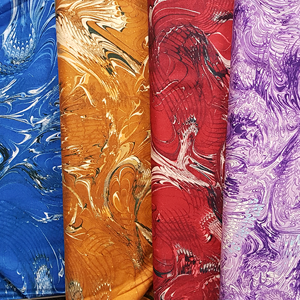 Women’s Business fabric is available in two colorways—Gold and Charcoal. Patch workers and quilters love this design. Our second artist is Natasha Stuart who designed Bush Tucker with Wild Fig. In Central Australia, wild fig grows naturally over a vast area. Fig is edible while raw and has a slight sweet taste. Dried figs are ground into a paste to eat. Aboriginal people arrived on the Australian continent at least 50,000 years ago (by carbon dating). Over the period, they found ways of surviving that reveal an extensive detailed knowledge of the environment. Their understanding of native plants goes far beyond knowing what is edible. For survival and hunting they invented weapons and tools. Many of these things were unknown until recently. Even towards the end of the last century, it was hard to find a bush tucker (bush food) restaurant. Many books on the various bush tuckers are available. Natasha’s artwork provides some foods to use with wild fig for some fine dishes. It comes in three colorways, black, red and yellow.